Posted on Fri, Mar 2, 2012 : 5:57 a.m. The Humane Society of Huron Valley earlier this week marked its 500th adoption so far this year with a little party and a video posted on its website. The happy adoptee was a 7-year-old cat named Bella, who had only been at the shelter for about a week, said Deb Kern, marketing director for the Humane Society. The number of adoptions so far this year is up nearly 10 percent from 454 adoptions during the first two months of last year, Kern said. The number of pets coming into the shelter is up a similar amount, Kern said. "It's good news that we're finding homes for them and bad news that our intake is up as well," Kern said. The shelter at 3100 Cherry Hill Road in Superior Township is open from noon to 6 p.m. every day. 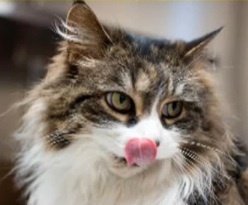 You can view pets available for adoption on the shelter's website. Fri, Mar 2, 2012 : 5:06 p.m.
Fri, Mar 2, 2012 : 4:47 p.m.
Congrats! Although I don't think I could go thru that. I don't like b day celebrations. But it certainly looked like fun. Now if the commissioners would see thought to not cutting their funding they could see they are making a difference in a pets life.